Do we need renewable energy? Is intermittency a problem with wind energy? Do wind farms save on CO2 emissions? Do wind farms affect property values? Are wind farms built with taxpayers' money? How does the ROCs system work? If constructed, what turbines would be used on the site? What about the community benefit scheme? How will local people be kept informed about the wind farm proposal? Will local energy costs go down because of the wind farm? Does the UK have sufficient wind to make wind farms work? There is so much industrial pollution and energy consumption in the developing world, are wind turbines in the UK really going to make a difference to climate change? How much energy actually goes into the manufacture, construction and operation of wind power schemes? Can this energy ever be re-captured? Why don't we put all the wind turbines out to sea? 1. Do we need renewable energy? Yes, as the UK's Chief Scientific Adviser Sir David King said: "In my view, climate change is the most severe problem that we are facing today, more serious even than the threat of terrorism." The RSPB views climate change as the most serious long-term threat to wildlife: "Recent scientific research indicates that, as early as the middle of this century, climate change could commit one third or more of land-based plants or animals to extinction including some species of British birds." The catastrophic potential of climate change is recognised by governments and scientists across the world as well as the RSPB, Friends of the Earth, Greenpeace and the World Wildlife Fund for nature. They all believe we must act now to save our planet. We all have a part to play. We must all "think globally, act locally". 2. Is wind power enough? There is no single answer. We need to minimise energy consumption and encourage all renewable energy sources. Today, the most developed and effective renewable technology is wind power. Almost everybody, when asked, supports renewable energy and most people support wind power. But when a wind farm is proposed nearby, there is sometimes a shift in attitudes. And that is the problem, not all of us want wind farms in our back yards. Despite the fact that wind power is supported by 70-90% of the public and has clear environmental advantages, there can be fierce local opposition against new developments. This presents problems for planners and decision-makers as they seek to balance the concerns in the locality against the wider benefits to the environment. Interestingly, research shows that people usually become more supportive of wind farms once they are up and running. Those living closest often prove to be among the most enthusiastic about wind power (Source: Sustainable Development Commission). A comprehensive study by the Scottish Executive found that those living nearest to wind farms are their strongest supporters. 3. Is intermittency a problem with wind energy? It is a common misconception that because wind blows intermittently, and turbines can sometimes be seen motionless, then wind power is unreliable. But this is not true. The entire electricity system needs back-up, practically all the time, because fossil fuel and nuclear power stations are variable, much like wind energy. Power systems have always had to deal with variations caused by power station breakdowns /repairs /maintenance, as well as constantly fluctuating consumption. Large power stations (coal, gas, nuclear) can go off-line instantaneously, whether by accident or for maintenance, causing a massive loss of power. When a fossil fuel or nuclear power plant trips unexpectedly, the network can lose a 1,000MW or more instantly. That is true intermittency. Back-up plants must step in to meet the shortfall. Electricity consumption also fluctuates constantly - a sudden cold spell means everyone turns on the central heating; a break in a popular TV programme means everyone rushes to switch the kettle on. But we expect instant power for lights, TVs, computers, whatever the weather, whatever the time. Variations in wind energy, and other energy sources, are ironed out because there are many units in operation, of different types and back-up is always available. The UK system will not notice the shutdown of a 2MW wind turbine, but it will have to respond to the loss of a 500MW coal plant or 1,000MW nuclear plant. Wind energy does not suddenly trip off the system. The wind does not blow continuously in one place, but there is little overall impact if the wind stops blowing somewhere - it is always blowing somewhere else. The more wind farms that are built over a wider geographical location, the more reliable wind energy is. 4. Do wind farms save on CO2 emissions? Yes, a typical wind turbine installed in the UK today is rated at 1.8MW, which will generate enough electricity each year for over 1,000 homes saving over 4,000 tonnes of CO2 emissions. 5. Do wind farms affect tourism? "Concerns have been expressed about the possible impact of the turbines on tourism; but, despite the construction of wind farms in various parts of the country, there is no cogent evidence to show a resulting reduction in visitor numbers. Indeed, Cornwall and Cumbria have the largest concentration of wind farms of any of the counties in England, yet, in both cases, the numbers of visitors attracted have increased since the turbines were erected ...... It should also be noted that some respondents to the survey undertaken for the Cumbria Tourist Board considered that the wind farm would be an additional attraction." 6. Do wind farms affect property values? There is currently no evidence in the UK showing that wind farms have a long-term impact on house prices. An extensive study was completed by a US Government-funded agency in 2003. This study examined around 25,000 property sales records over six years, straddling the pre- and post-construction periods of individual wind farms. The wind farms were built between 1998 and 2001. The study undertook three types of statistical assessment for each of 10 wind farm developments (a total of 30 analyses), looking at the immediate vicinity of the wind farm and at comparable communities without a wind farm. The study found that in 26 of these analyses, property values within 8km of the turbines actually performed better than in the comparable community. Two separate surveys around the Taff Ely Wind Farm in Mid-Glamorgan and Ardrossan Wind Farm in North Ayrshire drew similar conclusions. In Wales, Chartered Surveyors and planning consultants Dalton Warner Davies (DWD) looked at house sales around the Taff Ely Wind Farm in Mid-Glamorgan over a three-year period, with some properties only approximately 1km from the wind farm. The survey, carried out in 2006, found that three areas of housing had expanded since the wind farm began operating, and that asking prices were unaffected by having a direct view of the wind farm. A comparison of 'for sale' prices and original sales prices at 38 properties revealed a 91% increase between 2002 and 2005, compared to an 85% increase between sales prices over the same period elsewhere in Wales. Six local estate agents were also contacted and all reported that the wind farm did not have any effect on house prices. The Scottish survey was carried out by Glasgow-based CKD Galbraith, who selected the Ardrossan development because it is relatively close to a built-up area. Operational since 2004, the wind farm is clearly visible from the northern parts of two towns, Ardrossan and Saltcoats, and partially visible from West Kilbride. "Between 2000 and March 2004, values in the survey area on average increased by 23.1% compared to 7.4% for the Scotland-wide statistics. Similarly, from March 2004 [when the wind farm became operational] to date, property values in the survey area increased by 26% compared to the Scottish average of 17.1%." The RSPB state in their leaflet, Wind Farms and Birds: "Climate change is the most significant, long-term threat to biodiversity worldwide. To help tackle this threat, the RSPB strongly supports moves to increase energy efficiency, reduce energy demand and supply more of our energy needs from renewable sources, including wind power, provided they do not harm birds or their habitats." They went on to say that: "In the UK, we have not so far witnessed any major adverse effects on birds associated with wind farms." The RSPB has said that from its own studies at three wind farms in Wales, "the scale of bird strike does not seem to be of serious concern", and that wind turbines will have little impact on birds outside main migration routes. Siting is a crucial issue and developers should contact specialists such as the RSPB and conduct a thorough analysis of the risk to birdlife as part of the EIA. Similarly, there is no evidence to suggest damage to other wildlife or agricultural livestock, which often graze right up to the turbines." Friends of the Earth commented: "There is no conclusive evidence that wind turbines present more of a danger to birds than other structures, such as pylons or roads, when properly sited." 8. Are wind turbines noisy? According to Friends of the Earth: "This is now very rarely the case, due to advances in technology. Well-designed, well-sited turbines can be quiet enough to cause no disturbance to people living even just a few hundred metres away. At these distances, the noise they do make is usually drowned out by the natural noise of the wind itself in trees and vegetation." The Department of Trade and Industry (DTI) Wind Turbine Noise Working Group set up in 1993 has issued a guidance report providing information and advice for developers and local authorities when considering noise levels. 9. Are wind farms built with taxpayers' money? How does the ROCs system work? All forms of renewable and non-renewable energy receive subsidies in one form or another. The Nuclear Industry has received £70 billion in Government subsidy for its decommissioning programme. Conventional fossil fuels such as oil and gas receive tax breaks for exploration and research and development. However, there is no government subsidy for building wind farms. The support mechanism, known as Renewable Obligations Certificates (ROC), is only available for electricity that wind farms have already produced and supplied to utilities. Renewables Obligation Certificates (ROCs) are issued by Ofgem, the organisation that regulates the electricity and gas markets in Great Britain. ROCs have been designed to increase the profitability of renewable energy generation in order to help meet national and regional renewable energy targets. The Renewables Obligation, the Renewables Obligation Scotland and the Northern Ireland Renewables Obligation are designed to incentivise renewable generation into the electricity generation market. These schemes were introduced by the Department of Trade and Industry, the Scottish Executive and the Department of Enterprise, Trade and Investment respectively and are administered by the Gas and Electricity Markets Authority (whose day to day functions are performed by Ofgem). 10. If constructed, what turbines would be used on the site? At this time, Infinergy have not confirmed the model of turbines to be used at the wind farm site, as this will be subject to availability. We are not proposing to use second-hand turbines or older models, but will use new, state of the art machines. Our assessments of landscape and noise will be based on a generic turbine model, with a blade tip height of approximately 110 metres. 11. What about the community benefit scheme? 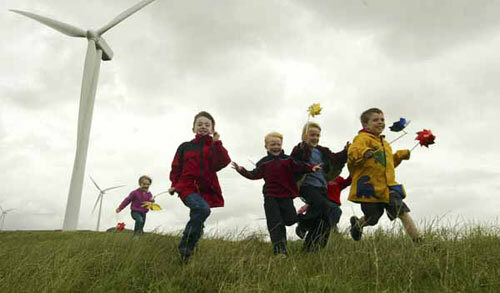 Infinergy believes that the local community should benefit from the development of a wind farm. For instance, a wind farm that moves to the construction stage can create opportunities for local contractors. Furthermore, Infinergy is keen to support the community on local initiatives. Therefore we would like to set up a trust fund which will be managed by local authorities and community members. Infinergy will donate revenue from the project to the fund. Typically this amount is up to £2,000 per megawatt installed per year. We would appreciate your suggestions regarding the community benefit fund, and we will be tracking all suggestions that come in. We hope to be able to help provide support to the local communities and we are aiming to gather feedback on ideas from all the surrounding communities. We will welcome all suggestions and hope to make this a positive contribution to the area. 12. How will local people be kept informed about the wind farm proposal? This is one of our key objectives and we are striving to keep all local residents informed through a variety of mechanisms such as a booklet, press releases, a freephone number, Freepost, website and email address. We have produced our first booklet, which has been sent to all local residents. Public exhibitions have been arranged for 12 and 13 March. We will be advertising the dates and locations for the exhibitions widely and hope for a strong interest from the local community. We hope to present some of the results of our assessments and surveys at the Public Exhibitions, for example photomontages showing how the turbines may appear in the landscape. All of our results will be presented in our Environmental Statement, which will be available for public viewing at the Council Offices after the Planning Application is submitted. 13. Will local energy costs go down because of the wind farm? It will not be possible to supply individual houses directly with the electricity produced from the proposed renewable energy scheme, although we hope that this will change in the future. The electricity from the scheme will be fed into the National Grid, which in turn could be purchased from your electricity provider. How much your provider charges is not in our control but we believe that with more demand for green electricity, it will one day become cheaper than electricity produced by conventional methods (i.e. the burning of fossil fuels). 14. Does the UK have sufficient wind to make wind farms work? It is a well known fact that the UK is one of the windiest countries in Europe and as a result it is estimated that a wind turbine in the UK would typically be producing energy for 70-85% of the year (Source: BWEA). The average wind speed at Tom Nan Clach is approximately nine metres per second above ground level. In order to seek reassurance, Infinergy has erected a met mast on site which measures the wind at 60m. The met mast will gather wind data for one year and will provide us with accurate on site data (Source: DTI Wind Speed Database). 15. There is so much industrial pollution and energy consumption in the developing world, are wind turbines in the UK really going to make a difference to climate change? There is evidence that immediate actions can overcome environmental threats! In the recent past, many countries have banned ozone-depleting CFCs in spray cans, the UK has banned the toxic pesticide DDT, international treaties are in place to help reduce acid rain and countries around the world are working towards the preservation of endangered species. There are things we can change in our daily lives and at a regional and national level in order to improve the global environment. The UK should strive to set an example for the rest of the world in terms of setting and achieving high environmental standards and aiming to reduce the effects of global warming. 16. How much energy actually goes into the manufacture, construction and operation of wind power schemes? Can this energy ever be re-captured? It should be noted that this concern applies to all types of electricity generating technologies, including nuclear energy, hydro energy and coal fuelled power plants. A number of studies have been done on the energy balance or "pay-back" of onshore wind farms, all of which are based on a number of variable assumptions, such as the size of the turbines and the location and wind speeds tested. The Sustainable Development Commission (SDC) recently summarised the output of some of these studies in their report Wind Power in the UK: A guide to the key issues surrounding onshore wind power development in the UK (2005) . 17. How long do wind turbines last? Modern wind turbines are designed to operate for around 25 years and at the end of their working life, the wind farm site at Tom Nan Clach can be restored at low financial and environmental costs. During the wind farm's lifetime, routine maintenance will be required. 18. Why don't we put all the wind turbines out to sea? We will need a mix of both onshore and offshore wind energy to meet the UK's challenging targets on climate change. By 2012, emissions must be reduced to 12.5% below the levels set in 1990. At present, onshore farms are more economical to develop; offshore wind farms take longer to build because the sea is inherently a more hostile environment. If offshore farms were the only form of wind generation it would make meeting our renewable energy targets very difficult.